The weird and wacky world of Spike Milligan and The Goons is recreated in a hugely entertaining staging of two classic radio scripts. It may have been typical damp and dismal British winter weather outside the MAC theatre but this is soon forgotten as the audience becomes immersed in the cast's zany humour, dreadful puns and silly voices. 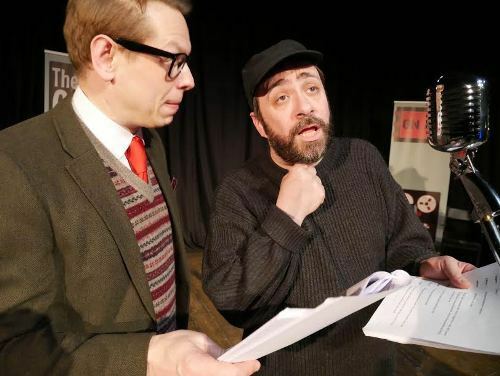 The Birmingham Comedy Festival and Fred Theatre's production of two Milligan scripts - The Jet-Propelled Guided NAAFI and The House of Teeth - is a triumph. And there is the added bonus of a jazz quartet, just as in the original radio broadcasts. 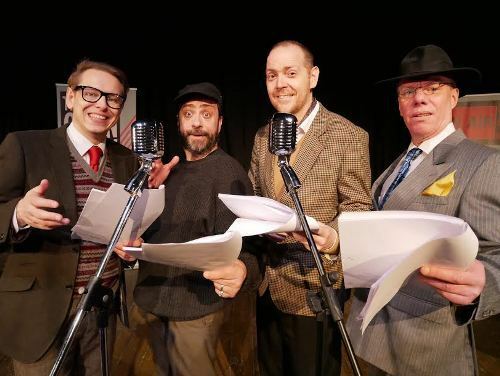 The show builds on the success of a similar production at 2014's Birmingham Comedy Festival which saw sold-out performances of The Canal and The Phantom Head Shaver episodes of The Goon Show. This new adaptation opens with The Jet-Propelled Guided NAAFI, originally broadcast on January 24, 1956, but still oddly relevant as it satirises government waste, alleged corruption and bumbling civil servants. On hearing that construction of a British consulate building in Ceylon is massively over budget, the suggestion is to burn it to the ground and build another at the correct price! The second episode, The House of Teeth, first broadcast on January 31, 1956, is about a creepy house where the occupant collects travellers' false teeth. It's all nonsense, of course, but the late Spike Milligan's scripts are sharp and it is obvious how the likes of Monty Python were influenced and where a generation of schoolchildren got new catchphrases to holler in the playground. It is simply staged, with the premise that the show is a live radio recording of The Goon Show. There is even some audience participation. 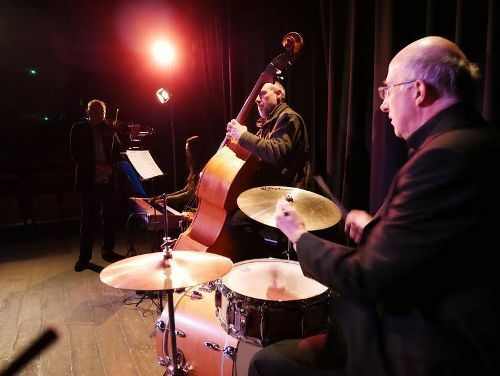 To the left is the jazz quartet – violinist Ralph Allin, keyboardist Jane Allin, bassist Nick Wiltshire and drummer Simon Clark. To the right are the actors/ comedians - Mark Earby (Spike Milligan), Richard Usher (Peter Sellers), Stephan Bessant (Harry Secombe) and Phil Hemming (Wallace Greenslade) – who move centrestage to deliver their lines into vintage microphones. We also see them supplying some of the sound effects such as horses' hooves and a ringing telephone. Predictably, it is Mark Earby as Spike Milligan who garners the most laughs – after all, why wouldn't Spike give himself the best lines? But he's closely followed by Richard Usher, introduced as 'Peter Sellers, the man of a thousand voices'. At one point I wondered how he kept track of which character he was playing as there seemed to be so many. Stephan Bessant is particularly good in The House of Teeth – I liked the way he asked for a different suit to be laid out for him, depending on the occasion – and Phil Hemming is also excellent as Dr Longdongle in the same episode. It was encouraging to see children and young people enjoying the show. I suspect that for some it was their first exposure to Eccles, Moriarty, Ned Seagoon, Bloodnok, Henry Crun and a host of other crazy Milligan characters. Well done to the producers for bringing this unique humour to a wider audience. The Goon Show moves to Henry Tudor House in Shrewsbury for a final show on February 12, 2017. Why? Inspired revival of British radio comedy gold. Sounds like a fun show. So many crazy characters! Great review! The Goon Show is such a classic.